Titles that end in a question mark require special attention. 1. When a title ends in a question mark, do not add a colon before the subtitle either in a note or in a bibliographical entry (CMS §14.105). 15. Bailey, Randall C., Tat-siong Benny Liew, and Fernando F. Segovia, eds. They Were All Together in One Place? Toward Minority Biblical Criticism, SemeiaSt 57 (Atlanta: Society of Biblical Literature, 2009). Bailey, Randall C., Tat-siong Benny Liew, and Fernando F. Segovia, eds. They Were All Together in One Place? Toward Minority Biblical Criticism. SemeiaSt 57. 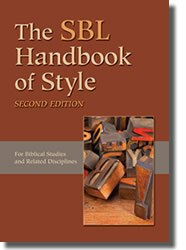 Atlanta: Society of Biblical Literature, 2009. 2. When the title would normally be followed by a period, do not add the period (CMS §14.105). 21. This argument is demonstrated in Bailey, Liew, and Segovia, They Were All Together in One Place? 3. When the title is followed by any other punctuation, keep the punctuation required by the surrounding text (CMS §14.105). Although the question mark will remain italicized as part of the title, the following punctuation should not be italicized. Groundbreaking in this regard was the volume They Were All Together in One Place?, which was edited by Randall Bailey, Tat-siong Benny Liew, and Fernando F. Segovia. 25. Bailey, Liew, and Segovia, They Were All Together in One Place?, 56–58. Thank you for the question. Yes. SBL follows the qualification in CMS 14.96: retain the colon before a subtitle when a question mark or exclamation point is followed by a closing quotation mark.